It’s “March Madness” in the Northern Hemisphere now, and a frenzy of activity in the yard or garden for you if you grow veggies or flowers or do your own lawn care and landscaping! Back and shoulder pain is fairly common, but, unfortunately, gardeners and landscapers very often suffer bouts of wrist and elbow pain that can get severe and even debilitating. Hence, these kinds of injuries are often known as Repetitive Strain or “Overuse” Injuries. Weakness + Fatigue – You start noticing that you have less and less grip strength for cutting/pruning, holding your garden tools and even carrying things. You feel weak and increasingly fatigued from less and less work. Burning or Stabbing Pain – Outright pain in your thumb, wrist or elbow is the surest sign that you’re heading toward injury. The pain can be a steady, dull burning or it can rise to the level of a sudden, sharp, stabbing pain, whether at the elbow, wrist or hand. I invite you to take my free video course called ‘Tennis Elbow 101’ – You’ll learn the differences between Golfer’s and Tennis Elbow, and I’ll walk you through some simple tests you can do to quickly assess yourself. Lifting and carrying larger plants, bags of soil, fertilizer or mulch or buckets of water can be especially hard on the back and shoulders. Of course, holding and handling these often awkward things can be a strain on the muscles of the wrist and fingers, which can lead to wrist tendon issues and to Golfer’s and Tennis Elbow at “the other end” where these muscles originate at the inner and outer elbow. The same goes for all the digging and pulling motions, whether simply weeding by hand or digging holes with a shovel or trowel. We should also include the motions involved in watering with a hose and things like weed whacking and hedge trimming. Reserving a special place in tendon pain hell for those weed whackers, leaf blowers and mechanical trimmers, with their weight, vibrations, awkwardness added to the requisite gripping and repetitive motions involved in using them. Pure misery when one is injured! But the #1 worst activity overall, (and a part of the other motions) is undoubtedly all the gripping and squeezing that gardeners and landscapers have to do so much of. It’s the constant gripping and holding or repetitive squeezing motions inherent in using manual clippers, trimmers and shears that really gets you. How Do The Repetitive Motions Of Gardening Cause Golfer’s Or Tennis Elbow? Yes, simply doing a task repeatedly enough times is going to overload muscles and tendons and cause aches and pains and, eventually, injury. But, at the same time, we know that the body is capable of adapting to increased physical demands by getting stronger. There’s something insidious about repetitive motions that can sometimes end up wearing us down, rather than causing us to get better and stronger, however. A lot of gardening activities require less that ideal postures, positions and motions. For example, all the bending over, the sustained awkward positions, reaching, gripping tools, pulling, etc. And making a lot of little motions over and over – especially squeezing clippers and pruning tools. Conversely, taking a long walk will not tend to produce much muscle tension. Sure, walking is repetitive, but it involves a lot of muscles moving rhythmically though a fuller range of motion, which tends to cause less problems. That’s not to say that it’s “unnatural” to hold a pair of pruning shears and repeatedly squeeze them to trim a bed of roses. And you can adapt to this and get stronger and more conditioned to it like one can to any exercise. IF you gradually acclimate to this activity! What the heck are ahesions!? I wouldn’t be surprised if ‘Adhesion’ is a term you haven’t encountered before. It means basically what it sounds like: Stuck stuff! Layers of muscle and other tissues sticking together. This is a process that happens slowly in all of our bodies – only more so in areas that are excessively tight and fatigued. Tension, compression and reduced circulation / oxygen cause the collagen protein in our tissues to gradually stick together. The more adhesions form, the more restricted the muscle becomes. This restriction is similar to tension – only you can’t just stretch or relax this “tension” away. It’s like velcro that’s binding layers of your muscle together. However, if adhesions continue to build up and the muscle continues to become “tighter” and more restricted, this can eventually begin to injure the tendons it’s attached to. In the beginning a tendon (which is the “connector” of muscle to bone) may only hurt for brief periods. Stress to tendons from repetitive motions does not cause immediate damage – like tears – any more than it causes sudden damage to the muscle. It’s a gradual, cumulative process. The pain will likely, initially only be a warning that the tendon is overloaded. If we take heed and care it may recover without being damaged. Of course, we don’t tend to do that! We tend to press on! There may be a period where the tendon gets inflamed – The “Classic Tendonitis” condition you hear so much about. But with continued stress and overload, the tendon healing process is notorious for failing and falling into a state of degeneration. This state of degeneration is known as Tendinosis to distinguish it from Tendonitis. In the simplest terms it’s a failure of the healing process to keep up with the strain and the tendon structure (Collagen Protein fibers) degrades and loses it’s strength and integrity. It breaks down. And it hurts like heck! Tendinosis is unfortunately what most chronic tendon injury sufferers are facing, whether it’s Tennis or Golfer’s Elbow or another, similar tendon condition. 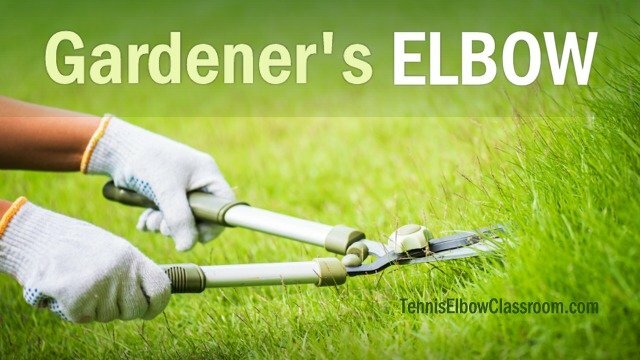 So, if you’ve had Gardener’s Elbow for several months, (especially 4-6 months or longer) it becomes a lot more likely that your tendon injury has become degenerative. This requires encouraging the healing process rather than discouraging, interfering with or outright suppressing it! How To And How NOT To Treat These Injuries! The big problem is that the standard treatments and “conventional wisdom” are all about suppressing symptoms rather than encouraging and helping the healing process. So, What’s The RIGHT Way To Treat It, Then?